With rocketing power prices and much worse to come, Australia’s renewable energy debacle has finally started to sharpen political thinking. Panic has set in, which, while not an ideal environment to form policy, will do in a pinch. Especially, when the alternative is doing nothing and watching an energy superpower turn itself into an economic basket case. South Australia did just that in less than a decade, with its maniacal obsession with wind and solar. But the populous and prosperous states to the east have the prospect of avoiding all that if, and only if, they hold onto their reliable coal-fired power plants and build a swag more to replace those reaching their use by date. The Nationals are demanding the construction of “a minimum of three” baseload power stations as the price of their support for Malcolm Turnbull’s national energy guarantee, as Tony Abbott last night called on the government to abandon the Paris climate agreement. Delivering a lecture to the Australian Environment Foundation — a climate sceptic think tank — in Melbourne last night, the former prime minister argued that abandoning the Paris targets would help “save” the Liberal Party and protect its legacy over the next 10 years. He defended his criticism of the energy guarantee as well as his push to build new coal-fired power stations by advocating for a profound overhaul of climate policy that would see Australia follow the lead set by Donald Trump. “Withdrawing from the Paris Agreement that is driving the ­national energy guarantee would be the best way to keep prices down and employment up, and to save our party from a political ­legacy that could haunt us for the next decade at least,” Mr Abbott said. The comments add to pressure over the national energy guarantee as the Nationals push their own separate agenda. A two-page list of demands aimed at combating the threat of sovereign risk for potential investors in new baseload power generators, including coal-fired stations, is being promoted by the Nationals as a “genuine and serious policy position” to supplement the Prime Minister’s signature energy policy. The confidential working document — obtained by The Australian — sets out the position of the minor Coalition party and advocates for the creation of a $5 billion fund to “ensure (a) reliable energy mix is delivered to Australian electricity users in the short, medium and long term”. Only coal, gas or traditional hydro projects capable of delivering electricity “24 hours a day, seven days a week, regardless of weather conditions” would be ­eligible for assistance under the proposal. Operating under a ­“government-owned company model”, the suggested fund would keep any new power stations off budget, like the approach taken with the western Sydney airport and ­inland rail projects. Recasting the already divisive energy debate as a struggle for the soul of the Liberal Party, Mr ­Abbott said that it took “character to do what’s right” as well as “courage to disagree with your peers”. “Far from ‘wrecking the government’, MPs worried about ­energy policy are trying to save it with a policy that would be different from Labor’s,” he said. Mr Abbott also canvassed ­unwinding Australia’s emissions targets or abandoning them to “whatever would actually be achieved in 2030 through normal business cost-cutting and efficiencies, plus whatever is delivered through the emissions reduction fund”. The Nationals are keen to ­ensure their push to supplement the energy guarantee is not linked to Mr Abbott’s alternative conservative agenda or the leadership as they seek to maximise their chances of Mr Turnbull and Energy Minister Josh Frydenberg agreeing to their key demands. The Australian can reveal that the $5bn fund proposed by the ­Nationals would be broken into two key components: a “grant fund” as well as an “equity fund”. It would sit within the infrastructure portfolio held by Nationals leader Michael McCormack. The grant fund would be used to “extend the life of existing plants or increase capacity, ­including emission reduction improvements … and rapid capacity improvements such as installing new units at existing stations”. However, grants would not be awarded for standard or planned maintenance to existing stations. The equity fund is aimed at the delivery of at least three new baseload power stations with a minimum capacity of 1200 megawatts according to a set of strict criteria, including a cost-benefit analysis against other projects to be conducted by the Infrastructure and Project Financing Agency. Both funds would work in consultation with the Energy Security Board, which would provide guidance on how assistance from the two funds should be allocated. Factors that would need to be considered for the finance of projects would include emissions ­reduction, “completion time and delivery to market” as well as the “availability of transmission ­capacity or the potential to deliver capacity in the short term”. Projects would also need to be located in an “area of forecast need”. Queensland LNP MP George Christensen told The Australian he would not support the national ­energy guarantee unless it included measures to drive more investment into baseload power generators. “I can’t support anything that doesn’t have an incentive built into it for baseload power,” Mr Christensen said. “Whether that’s grants, whether it’s direct investment or government equity in projects — all of the above should be ­considered”. Queensland LNP senator Barry O’Sullivan said he would not comment on “any resolutions of the partyroom” but said he was a very strong advocate for new clean coal-fired power generators. 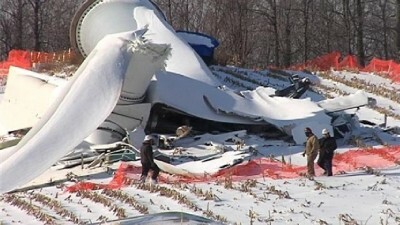 “They provide security of supply. They will put downward pressure on the cost of energy in the marketplace and the modern technologies that are used in the development of these power stations will also make a great contribution to the reduction in carbon emissions,” Senator O’Sullivan said. The Turnbull government yesterday took full ownership of Snowy Hydro Limited at a cost of more than $6bn, which NSW and Victoria will spend on infrastructure projects. Mr Abbott yesterday linked his push to abandon the Paris Agreement to dissatisfaction with the ­national energy guarantee, arguing the policy would be greatly ­improved if it contained a “price target as well as an emissions-­reduction target”. The speech will embolden other Coalition MPs to speak out against the Paris targets, which commit Australia to reducing emissions by 26-28 per cent on 2005 levels by 2030. Pinocchio, the Boy Who Cried Wolf and, now, Josh Frydenberg. Frydenberg has clearly lost all grip on reality. 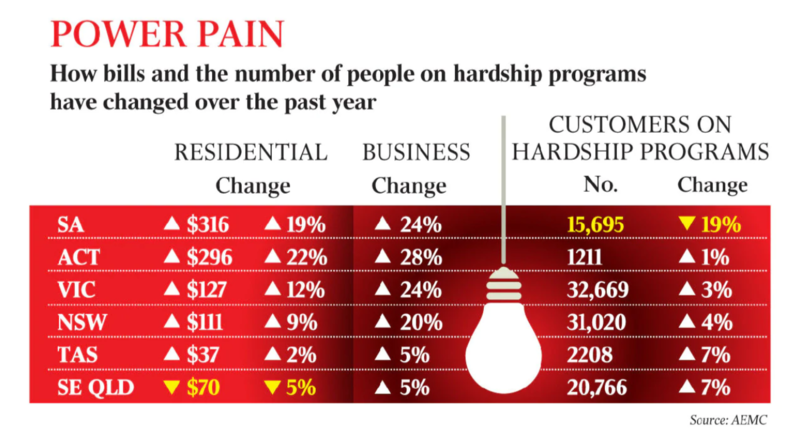 The idea that power prices are on the slide in Australia is complete and utter fantasy. The graphic above shows 20%-plus jumps in all those states attempting to rely on wind and solar. SA already pays the highest power prices in the world. Josh, attempting to weasel your way out of this later by saying that the promises weren’t yours, and that you were only repeating the mantra pitched up by the Energy Security Board, will not save you. The voting public is not only smarter than that, they’ve got a nasty habit of punishing politicians who tell brazen fibs, especially when they’re being belted in the hip pocket. You’ve been warned. And don’t just take STT’s word for it, The Australian is sounding the very same alarm. Less than a month from the “Super Saturday” by-elections and with the opposition in disarray over tax, the last thing Malcolm Turnbull needs is agitation within the Coalition, whipped up by Tony Abbott. That said, and more important for the nation, the last thing the economy needs is for soaring power prices and unreliable supply to undermine productivity, confidence and investment. The Prime Minister will be peeved over Mr Abbott’s feisty address to climate-sceptic think tank the Australian Environment Foundation, in which the former prime minister called for Australia to follow the US in exiting the Paris Agreement and abandon emissions targets to “save” the Liberal Party. It is true, as Mr Abbott said, that Australia would never have signed the Paris Agreement had the US not been a party to it. Closer to home, the Nationals, in a two-page list of demands agreed in their partyroom last week and obtained by Joe Kelly, are demanding the building of three new baseload power stations in which the commonwealth or the states would hold equity. A “government-owned company model”, used to deliver other vital infrastructure including the western Sydney airport, would keep any new power stations off budget. The Coalition partner also wants part of a $5 billion fund available to coal, gas or traditional hydro projects capable of delivering “electricity 24 hours a day, seven days a week, regardless of weather conditions” to deliver shorter-term improvements to the energy market. The fund would help extend the life of power plants, boost their capacity and cut emissions. Regardless of the former prime minister’s personal motivation, it is alarming but true, as Mr Abbott said on Monday, that the Turnbull government will be relying on the support of Labor states to back its ­national energy guarantee at next month’s crucial COAG meeting. Should the states, some of which are committed to renewable energy targets of 50 per cent, withhold their support, or offer it with unacceptable conditions, or if Mr Turnbull and Energy Minister Josh Frydenberg fail to secure Coalition support for the NEG, the government could be left scrambling without an energy policy to meet one of its main responsibilities — ensuring the provision of reliable and affordable power. The fact Australia faces such a possibility reflects woeful planning at state and federal level. The Nationals’ pragmatic stance is well timed. It comes as coal is set to regain its position as our biggest export earner due to rising prices and surging demand from Asia. China, Japan, India and Indonesia are among nations that have turned to cleaner coal technology to meet their expanding energy needs. Decision-makers here should not be blind to what is happening in other parts of the world. As we noted a fortnight ago, “this is a lesson Australia appears doomed to learn the hard way”. And despite the determination of some states to lock up their gas resources, LNG exports also are booming. While much of the national debate has been anchored in the politics of climate change and the Paris Agreement to limit global warming to less than 2C, the needs of business and households for reliable baseload power at competitive prices have been overlooked in some quarters. This should not be the case in a nation rich in energy resources. Nothing that Australia does, as Mr Abbott writes today, will make the slightest difference to climate. It is also true that China, responsible for 28 per cent of global emissions, and India (7 per cent) have made no Paris commitment and the US (15 per cent) has pulled out. 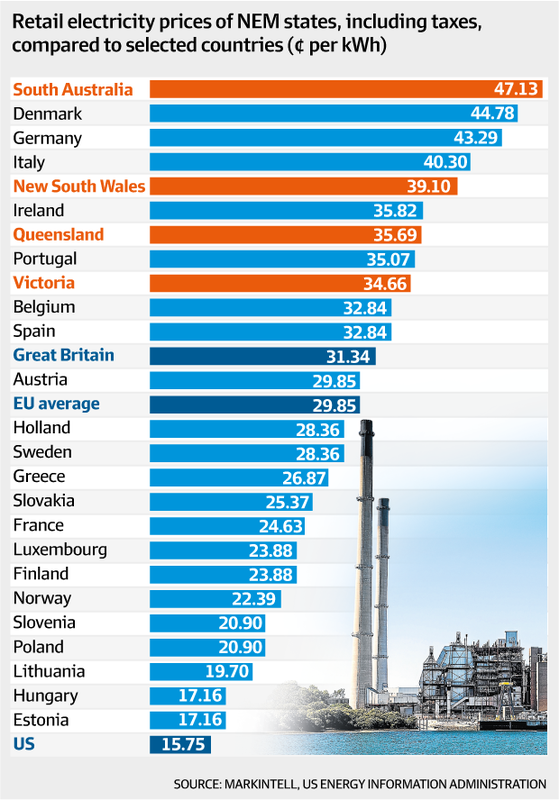 Australia is on track to meet its Paris target; but it is time to regain perspective. Emissions abatement should not jeopardise living standards. Has the world come to an end, did it disintegrate when the USA pulled out of the Paris Agreement? No, well then where is the problem if Australia with its minute earth destroying emissions input followed suit. Is our government saying Australia should bare the weight of emission reduction, after all countries in Europe are going back to coal and/or nuclear without all the who ha we in Australia are subjected to. What is wrong with Turnbull and his inner circle – what is keeping them from doing the right thing for Australia? Could it be the renewables industry has more sway than the rights of the people of Australia to have secure, sufficient quantity energy at a fare price when and where they need it. Mr Turnbull who comes first, us or your friends in the renewables industry? That is those who have taken over yours and your Ministers offices, those who have your ear while those with more sense and a social conscience are ignored? A realisation beginning to dawn elsewhere as well….and none too soon. Those in government presiding over the exorbitant energy costs in the list above, should be jailed for sheer incompetence and for deliberately causing national self harm. Their energy policy cannot not by any stretch of the imagination be said to “Save the Planet” !